Before kids are expected to make their scribbles into figures–before they can even draw a stick figure, they are experimenting with just two things: color and form. It can take an entire lifetime to get back to those moments of pure joy and wonder an artist experienced as a kid. Watching blue smash up against yellow. Forming a blob of color into a shape. This base level visual communication is profound to a kid, and then, one day, it just isn't anymore. Who was he? How did he change the course of visual art? 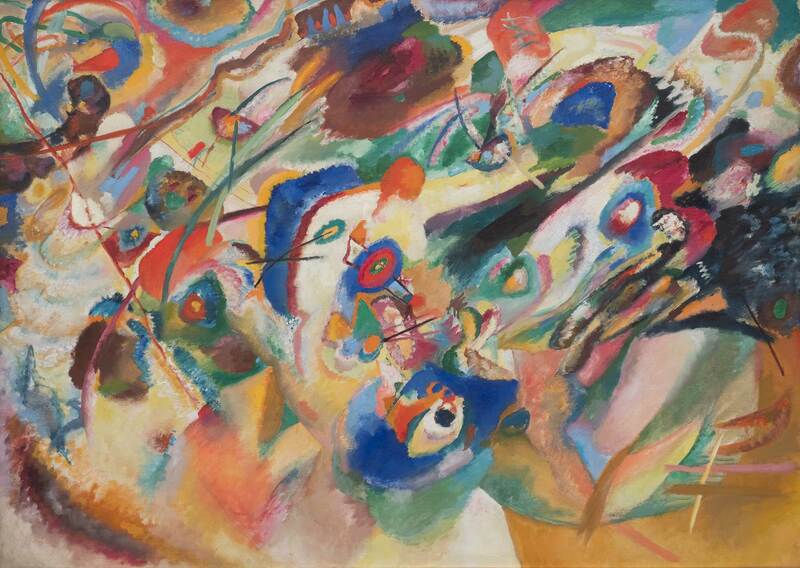 Wassily Kandinsky was literally the first guy to say 'this is art' and have it be something similar to what an innocent child would draw with crayons. Like everyone else at that time, he was taught how to paint figuratively–how to represent things from the real world with paint. 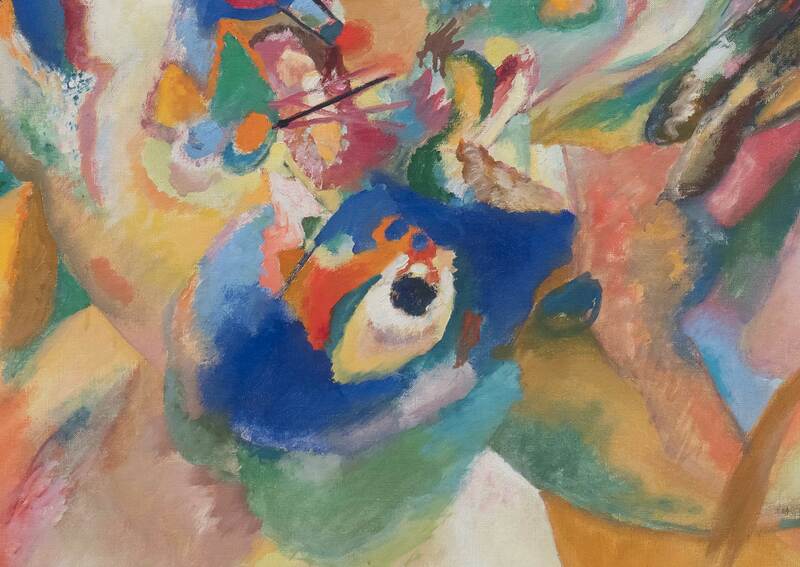 In 1910, at the top of his game, he decided to take the leap and do something that nobody was doing — Purely abstract visual compositions. These advanced compositions are like what you'd see a kid do with crayons, they are just WAY more masterful. 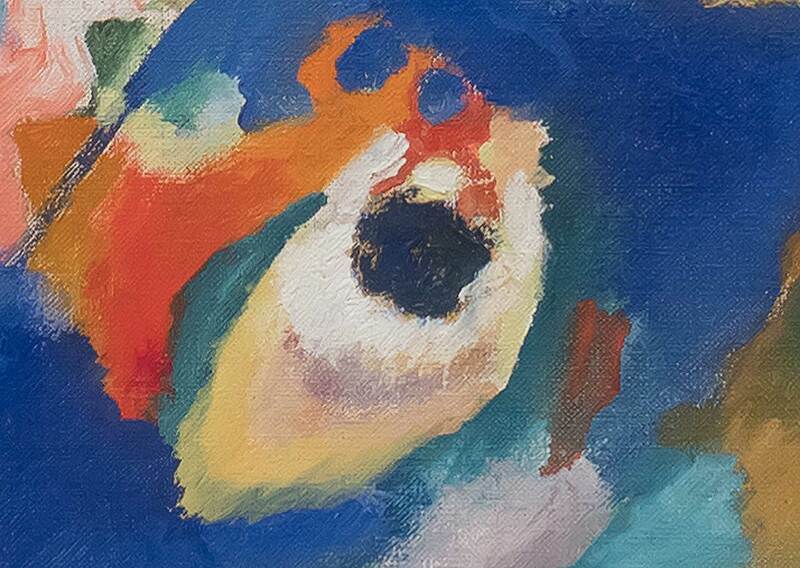 A pure composition using nothing but form and color painted by a visual master. Luckily he was a scholarly writer, so we have a lot of his thoughts and theory to learn from. Here are a few awesome excerpts from 'Concerning the Spiritual in Art'. Let's look at another Composition, the entire work is like a symphony, there's A LOT going on. but if you enhance... enhance... enhance... you'll find smaller and smaller movements within the overall composition then finally you get to the single elements of colors and forms acting one another. A painter, who finds no satisfaction in mere representation, however artistic, in his longing to express his inner life, cannot but envy the ease with which music, the most non-material of the arts today, achieves this end. 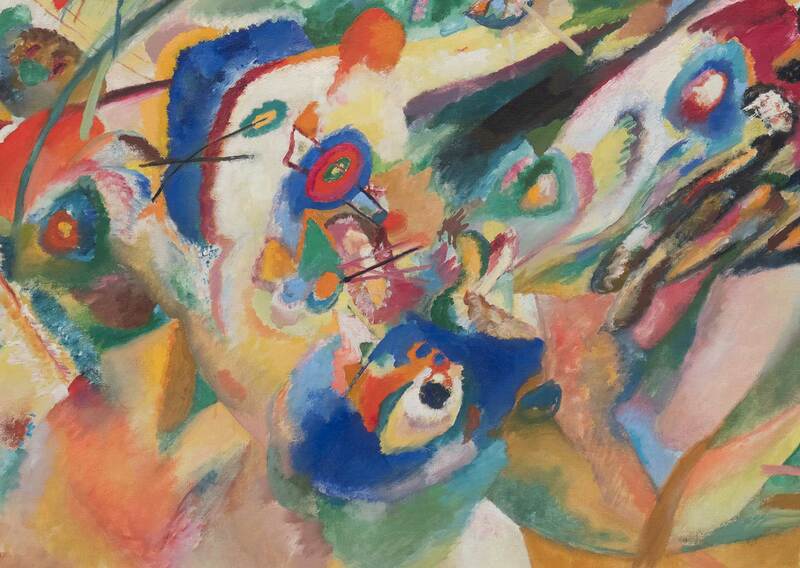 Artists back then spent their time learning to be a human camera, so Kandinsky was a little jealous of musicians getting recognition for their spiritual endeavors. Why not just be a musician? Painting is ahead of music in several particulars. Music, for example, has at its disposal the duration of time; while painting can present to the spectator the whole content of its message at one moment. So there are advantages of making visual art over music. You see it all in a moment. Here lies a lot of it's power. It can grab your attention and get something across very quickly. What!? Colors have spiritual values? Why wasn't I told this in art school? There is no need to engage in the finer shades of complicated colour, but rather at first to consider only the direct use of simple colours. To begin with, let us test the working on ourselves of individual colours, and so make a simple chart, which will facilitate the consideration of the whole question. Two great divisions of colour occur to the mind at the outset: into warm and cold, and into light and dark. To each colour there are therefore four shades of appeal—warm and light or warm and dark, or cold and light or cold and dark. Generally speaking, warmth or cold in a colour means an approach respectively to yellow or to blue ... The movement is an horizontal one, the warm colours approaching the spectator, the cold ones retreating from him. The colours, which cause in another colour this horizontal movement, while they are themselves affected by it, have another movement of their own, which acts with a violent separative force. This is, therefore, the first antithesis in the inner appeal, and the inclination of the colour to yellow or to blue, is of tremendous importance. Figure I. Concerning the Spiritual in Art–honestly, i’m not a big fan of his diagrams, but adding them in here anyway. Yellow and blue have another movement which affects the first antithesis—an ex-and concentric movement. 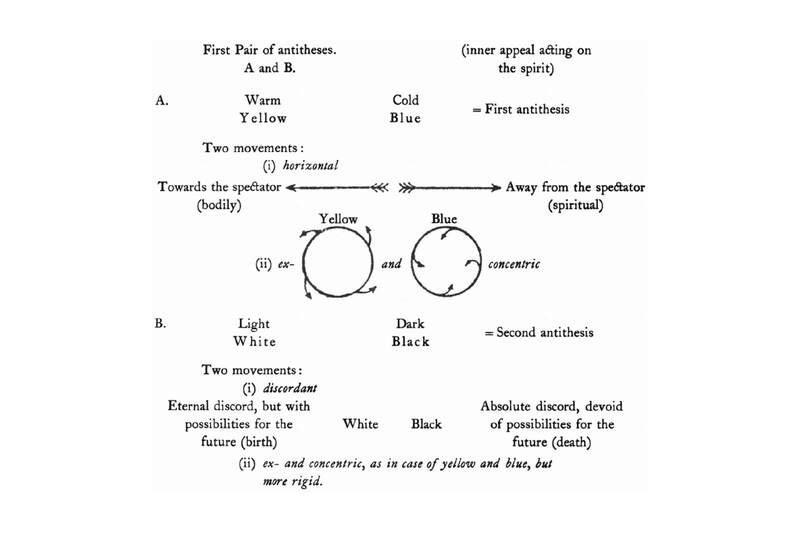 If two circles are drawn and painted respectively yellow and blue, brief concentration will reveal in the yellow a spreading movement out from the centre, and a noticeable approach to the spectator. The blue, on the other hand, moves in upon itself, like a snail retreating into its shell, and draws away from the spectator. you could stare at those circles for a while, but i think these examples below do a better job of showing the movement of yellow and blue. 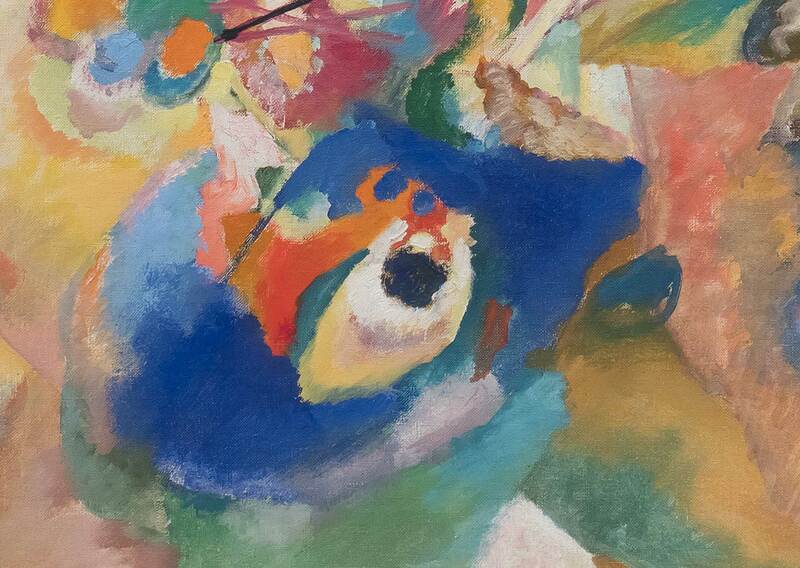 On the first figure, the blue added to the center seems to be cutting into the yellow, deeper and deeper, making it look like a funnel, or falling down a well. When we gradually add yellow to the center of blue on the other hand, it builds upwards towards you, like a cone or a little mountain on top of the blue. Same two colors, same exact form, yet they produce opposite directions of movement. In the case of light and dark colours the movement is emphasized. That of the yellow increases with an admixture of white, i.e., as it becomes lighter. That of the blue increases with an admixture of black, i.e., as it becomes darker. This means that there can never be a dark-coloured yellow. The relationship between white and yellow is as close as between black and blue, for blue can be so dark as to border on black. Besides this physical relationship, is also a spiritual one (between yellow and white on one side, between blue and black on the other) which marks a strong separation between the two pairs. An attempt to make yellow colder produces a green tint and checks both the horizontal and excentric movement. The colour becomes sickly and unreal. The blue by its contrary movement acts as a brake on the yellow, and is hindered in its own movement, till the two together become stationary, and the result is green. Similarly a mixture of black and white produces gray, which is motionless and spiritually very similar to green. But while green, yellow, and blue are potentially active, though temporarily paralysed, in gray there is no possibility of movement, because gray consists of two colours that have no active force, for they stand the one in motionless discord, the other in a motionless negation, even of discord, like an endless wall or a bottomless pit. Because the component colours of green are active and have a movement of their own, it is possible, on the basis of this movement, to reckon their spiritual appeal. The first movement of yellow, that of approach to the spectator (which can be increased by an intensification of the yellow), and also the second movement, that of over-spreading the boundaries, have a material parallel in the human energy which assails every obstacle blindly, and bursts forth aimlessly in every direction. Yellow, if steadily gazed at in any geometrical form, has a disturbing influence, and reveals in the colour an insistent, aggressive character. [Footnote: It is worth noting that the sour-tasting lemon and shrill-singing canary are both yellow.] The intensification of the yellow increases the painful shrillness of its note. Yellow is the typically earthly colour. It can never have profound meaning. An intermixture of blue makes it a sickly colour. It may be paralleled in human nature, with madness, not with melancholy or hypochondriacal mania, but rather with violent raving lunacy. The power of profound meaning is found in blue, and first in its physical movements (1) of retreat from the spectator, (2) of turning in upon its own centre. The inclination of blue to depth is so strong that its inner appeal is stronger when its shade is deeper. Blue is the typical heavenly colour. The ultimate feeling it creates is one of rest. When it sinks almost to black, it echoes a grief that is hardly human. In music a light blue is like a flute, a darker blue a cello; a still darker a thunderous double bass; and the darkest blue of all-an organ. A well-balanced mixture of blue and yellow produces green. The horizontal movement ceases; likewise that from and towards the centre. The effect on the soul through the eye is therefore motionless. This is a fact recognized not only by opticians but by the world. Green is the most restful colour that exists. On exhausted men this restfulness has a beneficial effect, but after a time it becomes wearisome. Pictures painted in shades of green are passive and tend to be wearisome; this contrasts with the active warmth of yellow or the active coolness of blue. In the hierarchy of colours green is the "bourgeoisie"-self-satisfied, immovable, narrow. It is the colour of summer, the period when nature is resting from the storms of winter and the productive energy of spring (cf. Fig. 2). Any preponderance in green of yellow or blue introduces a corresponding activity and changes the inner appeal. The green keeps its characteristic equanimity and restfulness, the former increasing with the inclination to lightness, the latter with the inclination to depth. In music the absolute green is represented by the placid, middle notes of a violin. Black and white have already been discussed in general terms. More particularly speaking, white, although often considered as no colour (a theory largely due to the Impressionists, who saw no white in nature as a symbol of a world from which all colour as a definite attribute has disappeared). This world is too far above us for its harmony to touch our souls. A great silence, like an impenetrable wall, shrouds its life from our understanding. White, therefore, has this harmony of silence, which works upon us negatively, like many pauses in music that break temporarily the melody. It is not a dead silence, but one pregnant with possibilities. White has the appeal of the nothingness that is before birth, of the world in the ice age. A totally dead silence, on the other hand, a silence with no possibilities, has the inner harmony of black. In music it is represented by one of those profound and final pauses, after which any continuation of the melody seems the dawn of another world. Black is something burnt out, like the ashes of a funeral pyre, something motionless like a corpse. The silence of black is the silence of death. Outwardly black is the colour with least harmony of all, a kind of neutral background against which the minutest shades of other colours stand clearly forward. It differs from white in this also, for with white nearly every colour is in discord, or even mute altogether. Not without reason is white taken as symbolizing joy and spotless purity, and black grief and death. A blend of black and white produces gray which, as has been said, is silent and motionless, being composed of two inactive colours, its restfulness having none of the potential activity of green. A similar gray is produced by a mixture of green and red, a spiritual blend of passivity and glowing warmth. The unbounded warmth of red has not the irresponsible appeal of yellow, but rings inwardly with a determined and powerful intensity. It glows in itself, maturely, and does not distribute its vigour aimlessly (see Fig. 2). The varied powers of red are very striking. By a skillful use of it in its different shades, its fundamental tone may be made warm or cold. Light warm red has a certain similarity to medium yellow, alike in texture and appeal, and gives a feeling of strength, vigour, determination, triumph. In music, it is a sound of trumpets, strong, harsh, and ringing. Vermilion is a red with a feeling of sharpness, like glowing steel which can be cooled by water. Vermilion is quenched by blue, for it can support no mixture with a cold colour. More accurately speaking, such a mixture produces what is called a dirty colour, scorned by painters of today. But "dirt" as a material object has its own inner appeal, and therefore to avoid it in painting, is as unjust and narrow as was the cry of yesterday for pure colour. At the call of the inner need that which is outwardly foul may be inwardly pure, and vice versa. The two shades of red just discussed are similar to yellow, except that they reach out less to the spectator. The glow of red is within itself. For this reason it is a colour more beloved than yellow, being frequently used in primitive and traditional decoration, and also in peasant costumes, because in the open air the harmony of red and green is very beautiful. Taken by itself this red is material, and, like yellow, has no very deep appeal. Only when combined with something nobler does it acquire this deep appeal. It is dangerous to seek to deepen red by an admixture of black, for black quenches the glow, or at least reduces it considerably. But there remains brown, unemotional, disinclined for movement. An intermixture of red is outwardly barely audible, but there rings out a powerful inner harmony. Skillful blending can produce an inner appeal of extraordinary, indescribable beauty. The vermilion now rings like a great trumpet, or thunders like a drum. Cool red (madder) like any other fundamentally cold colour, can be deepened—especially by an intermixture of azure. The character of the colour changes; the inward glow increases, the active element gradually disappears. But this active element is never so wholly absent as in deep green. There always remains a hint of renewed vigour, somewhere out of sight, waiting for a certain moment to burst forth afresh. In this lies the great difference between a deepened red and a deepened blue, because in red there is always a trace of the material. A parallel in music are the sad, middle tones of a cello. A cold, light red contains a very distinct bodily or material element, but it is always pure, like the fresh beauty of the face of a young girl. The singing notes of a violin express this exactly in music. Warm red, intensified by a suitable yellow, is orange. This blend brings red almost to the point of spreading out towards the spectator. But the element of red is always sufficiently strong to keep the colour from flippancy. Orange is like a man, convinced of his own powers. Its note is that of the angelus, or of an old violin. Just as orange is red brought nearer to humanity by yellow, so violet is red withdrawn from humanity by blue. But the red in violet must be cold, for the spiritual need does not allow of a mixture of warm red with cold blue. Violet is therefore both in the physical and spiritual sense a cooled red. It is consequently rather sad and ailing. It is worn by old women, and in China as a sign of mourning. In music it is an English horn, or the deep notes of wood instruments (e.g. a bassoon). The two last mentioned colours (orange and violet) are the fourth and last pair of antitheses of the primitive colours. 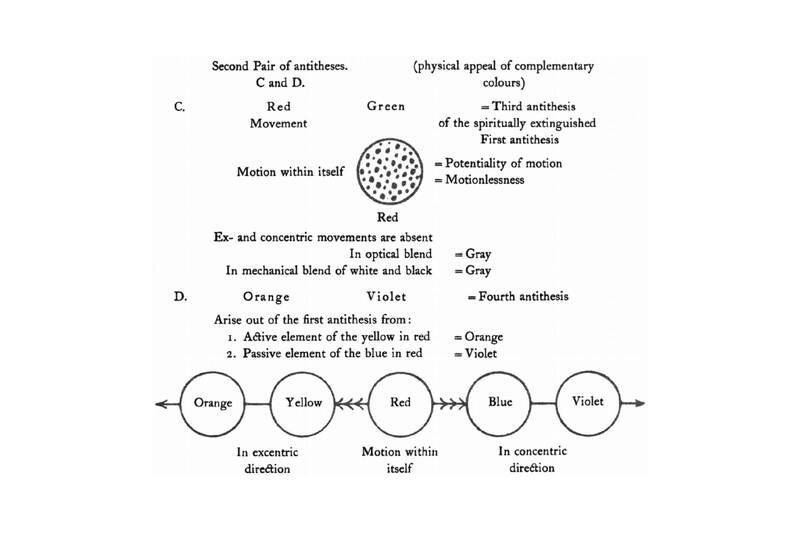 They stand to each other in the same relation as the third antitheses—green and red—i.e., as complementary colours (see Fig. 2). As in a great circle, a serpent biting its own tail (the symbol of eternity, of something without end) the six colours appear that make up the three main antitheses. And to right and left stand the two great possibilities of silence—death and birth (see Fig. 3). It is clear that all I have said of these simple colours is very provisional and general, and so also are those feelings (joy, grief, etc.) which have been quoted as parallels of the colours. For these feelings are only the material expressions of the soul. Shades of colour, like those of sound, are of a much finer texture and awake in the soul emotions too fine to be expressed in words. wow that was a lot, if you read all this hats off to you, go make yourself a cocktail.